DonationTo is pleased to provide an easy to use platform for natural disaster fundraising. In fact, we have hosted thousands of campaign pages for people around the world. Therefore, it was natural that people would turn to our platform when it was time to begin crowdfunding for Philippines relief. As part of our commitment to helping you meet your fundraising for Haiyan goal, we will enable you to avoid paying for any extra credit card processing fee. Additionally, you will be able to keep 100 percent of the money that you raise. DonationTo also allows all fundraisers to access the money that is contributed on a daily basis. 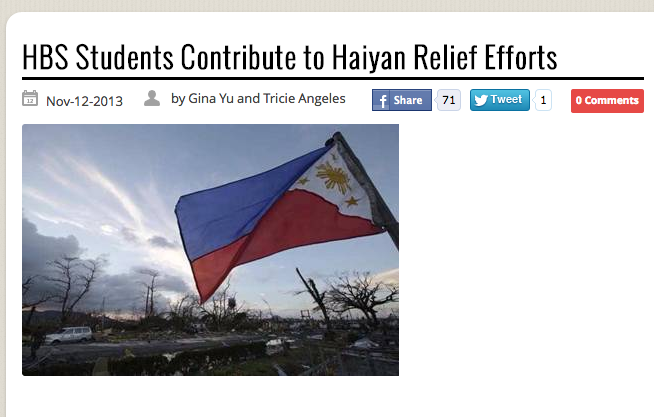 This will make it much easier to provide instant relief for the effort to rebuild Philippines homes and provinces. Another perk of using DonationTo as your natural disaster crowdfunding resource is that your supporters will be able to make a donation online 24/7 via any web enabled device. Additionally, we allow people to pay for their donation via PayPal or WePay, and this will make it much easier for supporters to contribute to your natural disaster crowdfunding campaign. Therefore, we invite all interested individuals to launch a fundraising for Philippines page today. A group of Filipino graduate students calling themselves the Friends of the Philippines made the decision to utilize DonationTo in order to help rebuild Philippines homes. Their goal is to raise $50,000 so that they can help several Filipinos return to their former lifestyle. Because the homes in this region are simplistic, it will only cost approximately $350 to rebuild each one. The hosts of this crowdfunding for Haiyan relief campaign realize that it will take years for the region to get back to normal, but they hope to begin providing immediate relief to some of the area’s residents. The BaHaiyan natural disaster fundraising campaign has the ambitious goal of raising $50,000. Fortunately, they were able to raise almost $6,300 in just a few days. This illustrates the timeliness of launching their crowdfunding for Haiyan relief page so quickly after the typhoon. After all, most people are more interested in helping immediately after a disaster strikes. Because of this, DonationTo recommends starting a natural disaster fundraising campaign within the first 72 hours. It is also important to keep people in the loop about your progress. Posting regular updates will encourage previous donors to contribute again. They also reiterate that donations can be accepted here which is powered by DonationTo.com that enables anyone to keep 100% of all donations collected. Enabling people to leave a comment with their contribution will make them feel more connected to your cause. Additionally, they will be more likely to spread the word about your fundraising for Haiyan relief efforts. The media has highlighted the extreme devastation that the Philippines experienced after the typhoon. Although it is difficult to see images and hear stories about the hundreds of thousands of people who have been displaced from their homes, it is perhaps even worse to hear stories about individuals. For example, Ronald Calipayan is the perfect example of the challenges that are now facing business and homeowners in this region. Calipayan lost his electronics shop in the typhoon, and his home was also destroyed. Now he and his family have been forced to scavenge in order to eat, and his nephew has joined the looting in order to assist his family. The 14-year-old boy feels badly about looting, but he also feels that he has no other choice. When you consider how many people are dealing with similar stories, it becomes very easy to imagine yourself in their position. After all, we are all just one natural disaster away from being forced to loot and scavenge for food. The streets of Tacloban are still impossible to get through. The area is filled with downed power lines and trees, and there are also armed troops and gangs hanging out on street corners. This certainly makes a scary situation even worse for the survivors. Unfortunately, until the debris can be cleared, it will be very difficult for rescue workers to provide them with the necessary supplies. In the meantime, most people will be forced to take desperate measures in order to eat. On November 14, 2013, 21 U.S. helicopters arrived with food and water. Additionally, utility workers went back to work in Tacloban. Because the damage to the area is so severe, the utility workers are focusing on cleaning up debris instead of restoring power. Therefore, it is still imperative for people around the world to provide financial support to help aid the cleanup and rescue effort. After all, without the proper assistance, it will be nearly impossible to return the area to its formal state of normality. People around the world have quickly launched fundraising campaigns in order to help the millions of people who were affected by the typhoon in the Philippines. DonationTo is pleased to provide a platform for several of these campaigns. For example, the Friends of the Philippines fundraiser is attempting to raise $50,000 in order to help build new homes. By selecting DonationTo as their platform, this group will be able to avoid paying for any additional credit card processing fees, and they will also be able to utilize every penny that they receive for their cause. Although the total amount of damage may take months to determine, it is imperative to provide financial assistance immediately to the residents of the Philippines. The Friends of the Philippines fundraiser raised $6,300 in just a couple of days. By harnessing the power of the Internet, they hope to achieve their goal by the end of November. To assist them, we have provided an easy to use platform that allows their supporters to make a contribution 24/7 from any web enabled device.